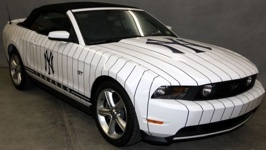 Only one 2010 Yankees custom Mustang was built for the New York Yankees organization and auctioned off. Normally we don't put, one-of-a-kind, custom Mustangs in this section but we did in this case because 60 of these Mustangs were offered in 2005. This is a one-of-a-kind Performance White 2010 Yankees Mustang GT that was auctioned off for charity. The car was created to celebrate the opening of a new stadium and was originally the prize of a sweepstakes. The exterior pin striping has been painted on. On the inside is black leather with blue lighting. There was actually several years of Yankee Mustangs.